Gov. Greg Abbott remains Texas voters' favorite state official, with more voters giving him good grades than bad, and the Republican voters he depends on heaping him with approval they're not giving to potential rivals, according to the latest University of Texas/Texas Tribune Poll. The figurative wrestling match between the state’s top three officials jiggled their approval ratings, but not by much, according to the latest University of Texas/Texas Tribune Poll. Gov. 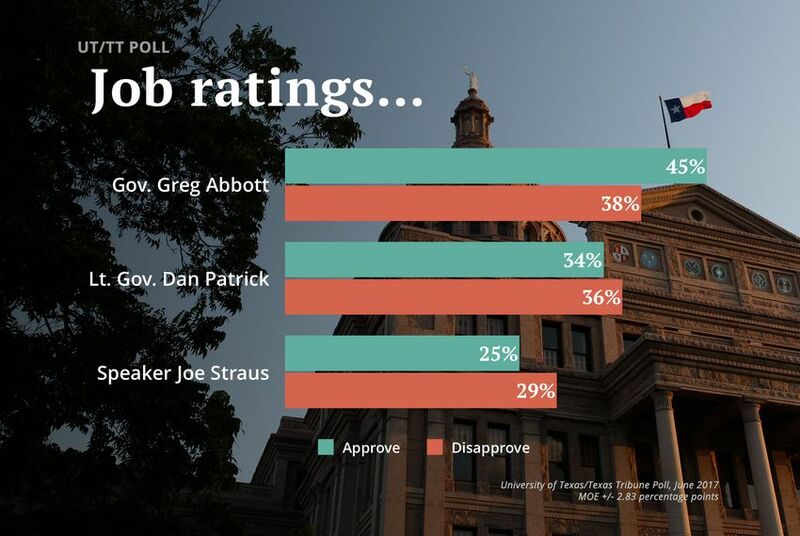 Greg Abbott remains the highest rated of the state’s high officials, with 45 percent of voters saying they approve his job performance and 38 saying they disapprove. That’s slightly higher than the 33 percent who disapproved in February’s UT/TT Poll, but he continues to get more positive than negative reviews. The same can’t be said for his legislative colleagues. Lt. Gov. Dan Patrick and House Speaker Joe Straus have more negative than positive reviews, though the margins are small. Patrick got good reviews from 34 percent of voters and bad ones from 36 percent; Straus had 25 percent good reviews and 29 percent negative ones. The speaker, as is ordinarily the case, remains the least well-known of the three, with 46 percent of voters either giving him neutral or no ratings. Republican voters clearly have a favorite in Abbott, with 83 percent approving his job performance. Patrick gets good marks from 68 percent of those voters. Among Tea Party Republicans, Abbott gets approving nods from 90 percent; Patrick from 78 percent. The most popular U.S. senator from Texas is Ted Cruz, with 38 percent of Texas voters saying they approve of the job he’s doing, while 28 percent approve of John Cornyn’s work in the Senate. But Cruz is also the leader in negative reviews, getting those from 44 percent of voters. Cornyn got negative marks from 41 percent. That said, the margins are important, and Cornyn had a wider gap — 13 percentage points — between his bad notices and his favorable ones. The senior senator from Texas won’t be on the ballot in 2018. Cruz will be, and U.S. Rep. Beto O'Rourke, D-El Paso, plans to challenge him. The incumbent is much better known: 18 percent said either that they had a neutral opinion of Cruz or no opinion at all. O’Rourke, who has never run for office outside of El Paso, isn’t a name brand yet: 13 percent of Texas voters have a neutral opinion of him, but 55 percent have no opinion at all. “The rumblings that Ted Cruz was damaged by his presidential campaign were overstated,” said Jim Henson, head of the Texas Politics Project at the University of Texas at Austin and co-director of the poll. Where 37 percent of voters have positive opinions of Cruz, 45 percent have unfavorable opinions. Among Republican voters, Cruz did much better, with 68 holding favorable views; 87 percent of Tea Party Republicans like him. The lesser-known El Pasoan is viewed favorably by 18 percent of Texas voters, unfavorably by 15 percent. Texas voters trust the U.S. Supreme Court and the judicial branch of government more than the legislative or executive branches, and they hold Congress in especially low regard. While 38 percent said they trust the courts most, 26 percent pointed to the president and the executive branch and only 6 said Congress is their most trusted part of the federal government. Another 30 percent registered no opinion. Democratic voters were more likely to choose the courts — 56 percent put their votes there — while 48 percent of Republicans put their faith in the president. Congress was the favorite of 8 percent or less in every subgroup in the poll: by party, by ideology, race or gender. It’s a Washington thing; Texas lawmakers fared much better on the report cards from voters, with 34 percent saying the approve and 42 percent saying they disapprove of the work the Legislature is doing. Standing alone, those are hardly good marks, but next to Congress, they look stellar. Eight years after it first appeared forcefully on the national political scene, the Tea Party remains influential with Texas voters, with 16 percent saying they would vote for a congressional candidate from the Tea Party over Republicans and Democrats if that were an option. Asked about the Tea Party’s influence, 30 percent said it has too much, 26 percent said it has too little and 16 percent said it has just the right amount. This is one of several stories on the latest University of Texas/Texas Tribune Poll. Earlier: Texans on President Trump and the Russia inquiries. Coming next week: Texans’ views on issues.